A couple of weeks ago I stumbled upon a cake carrier at the thrift store for a whopping 3-dollars! So, to break it in I made a carrot cake. Something really neat about the carrier is that you can also carry a pie at the same time; the top has a separate compartment just for it....or, perhaps it's for the plates, forks and napkins. 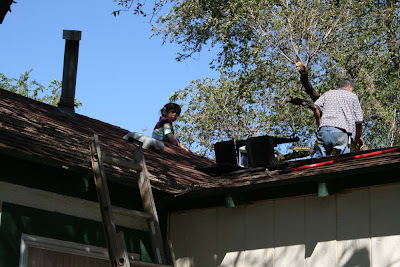 On Saturday morning Pat began pruning tree branches that hung over the house. I was very surprised to see Elizabeth on the roof watching him! The branches were scattered everywhere but thankfully we had control over where they landed. Once this was completed the roof was swept and then washed down with the garden hose; there was so much dirt and sand build-up it looked like chocolate milk raining off the roof. Now it will be easier to listen to the wind blow and not worry about a large tree branch going through the roof. Is it Authentic... or a Fake? Today I found a black leather Gucci purse at the Goodwill. With a nice sturdy bottom. The inside is well made with a nice fabric and several compartments. The inside tag does not say Gucci. The price was excellent for either an authentic purse or a fake purse. I heard on the radio this morning that today is the official last day of summer. My garden hasn't heard the news yet. I enjoy reading blogs and gathering ideas; especially ideas for different meals or snacks. Here is a fun and easy snack or lunch that we have made for years. See how thin the ham is? Begin by placing a tortilla onto a high flame. Using tongs turn the tortilla over and over until it bubbles up. And begin rolling it up. This also works well with bologna; or, try spreading on peanut butter when the tortilla is hot and then add honey; the peanut butter will melt and blends in well with the honey. The tears were flowing yesterday as I peeled and cut up many, many onions. At one point Elizabeth said she was tired because she couldn't keep her eyes shut; I soon realized it was the onions causing her eye to close. All the tears are now gone, the onion smell has left the house and I have several containers of onion puree in the freezer. The puree is very convenient when making soup. My first pumpkin from the garden. My first time cooking a pumpkin in the pressure cooker; it was so easy and quick! My first pumpkin bread made with my own home grown pumpkin. The bread turned out so good Elizabeth and I could hardly stop eating it! I love chocolate and I love a bargain. So what happens when you blend the two together? You only pay 4-cents per candy bar!!!!! A local Walgreen's had the Symphony milk chocolate and Hershey's milk chocolate with caramel marked $1.09 each. However, when I checked out the candy rang up 50-cents each and then because I purchased two Hershey products I received a dollar register reward (to be used on a future purchase). The cashier said I could do the deal a second time so I was able to double my bargain and ended up only having to pay tax, which was 16-cents so my candy bars cost me 4-cents each! Elizabeth discovered she is big enough to wear her new pajamas with feet. It isn't cold enough for them but she has decided to wear them anyway. My sister gave me some "popcorn bags" when we visited her last month. 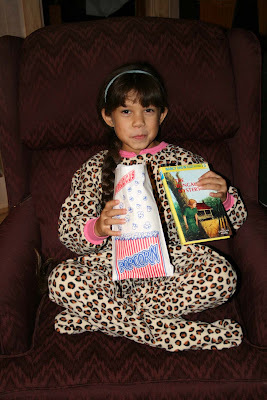 These bags make eating popcorn even more fun! Speaking of fun, Elizabeth has been enjoying the Nancy Drew books so much we are already on book #3 "The Bungalow Mystery". Bright and early this morning I was picking green beans, tomatoes, cucumbers and cantaloupe (out of 3 cantaloupes 1 was sweet and the other 2 were fed to the chickens). Along with canning green beans I had enough tomatoes to can 6 pints. My garden has been too fun! 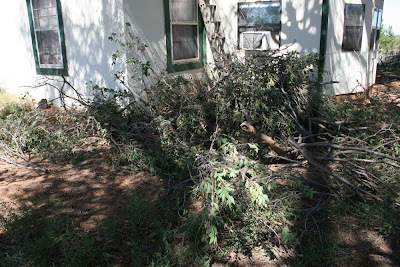 Over the weekend Pat cut down a Mesquite tree and drug it with the tractor to the house. All the leaves and small branches are cut off; And stored in a barrel for kindling. We are ready to bar-b-que! And the larger tomatoes are showing signs of ripening too! This tomato will be enjoyed on a sandwich. I was planning on chopping up the cherry tomatoes for canning but according to the Internet cherry tomatoes should not be canned. I don't see why it would matter so I think I will try canning them anyway and just see what happens. Several days ago I began searching the web for helpful information on butchering chickens. When it comes to butchering chickens I know how, but I have never been really good at it. My work began early this morning at 5:30 A.M. Pat helped me catch five of the biggest roosters which were placed in a portable pet carrier until I was ready for them. Next I lined a wheel barrel with cardboard and set it under a tree. I like hanging the chicken from a tree branch so I can have it at eye level while plucking feathers. A very helpful tip I learned from the web was to set up a sink while butchering; this old bathroom sink worked very well. I began butchering at 7:00 A.M. and by 9:30 A.M. all the roosters were finished. Normally I discard the neck and gizzard but the sink set up worked so well I had plenty of time to clean these extra parts. The gizzards that came out of the roosters were the biggest ones I have ever seen. I am not sure why the link isn't working on my end; the front page comes up. If you want to see the photos of a chicken being butchered just type "butchering a chicken" in the small white box located at the top left corner of the Cultivating home blog. My cantaloupe didn't have much of a chance in the garden when the pumpkin began taking over. As the pumpkin leaves began drying out the cantaloupe vines were exposed revealing very small melons. Yesterday I picked two ripe ones, but they were tasteless. I have about 4 or 5 more still in the garden; hopefully I will get at least one sweet melon from the batch. When I re-planted cucumbers I also planted a gourd seed. This plant produces the perfect gourd for bird houses. My plan is to have Elizabeth paint the gourds to hang in our trees. She love painting and I am sure she will have a great time with the gourds. So far it looks like we are going to have several bird houses. On Friday I began a sewing marathon that didn't end until early this morning. The only work that got done around the house was the necessary jobs like feeding the animals and picking and canning green beans. It was a little hard on the family and a little hard on "my bottom" but so well worth it. I now have all 90 quilt blocks stitched and cut and ready to assemble into a quilt top.